GLD At Support + Bullish Falling Wedge. Adding Back Exposure to Mining Sector. 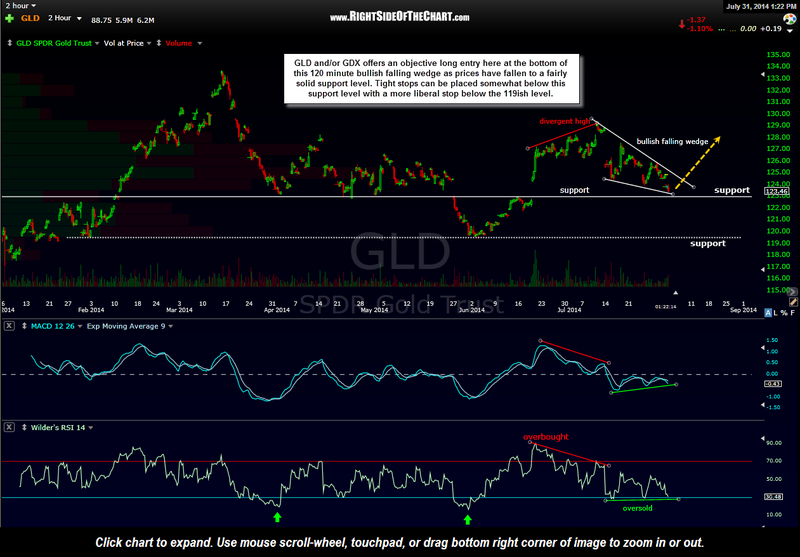 Home » Blog » GDX » GLD At Support + Bullish Falling Wedge. Adding Back Exposure to Mining Sector. I have decided to start adding back exposure to gold and the mining sector as GLD has fallen to a fairly solid support level while at the bottom of a bullish falling wedge pattern, as shown on this 120 minute chart. Although GDX remains near the bottom of its month-old trading range, as I often state, the miners will ultimately follow the shiny metal. As I continue to remain longer-term bullish on gold & expect pullbacks to be relatively shallow (assuming a new bull market is underway), a long entry on GLD and/or the miners here with the appropriate stops below looks to be the first objective entry that I’ve seen since removing my exposure to the mining sector in my trading account just over a month ago. A relatively tight stop can be placed somewhat below the 123 support level (to provide a small margin of error to allow for a brief overshoot) while a more liberal stop (my preference) would be to continue to scale into GLD and/or the miners if GLD continues down to that next support level that comes in around 119.50, with a stop somewhat below that level.